On Saturday, I had the pleasure of attending a series of three seminars presented by Franklin Carter Smith. Mr. Smith is currently employed as a librarian at the Clayton Library Center for Genealogical Research, a branch of the Houston Public Library. 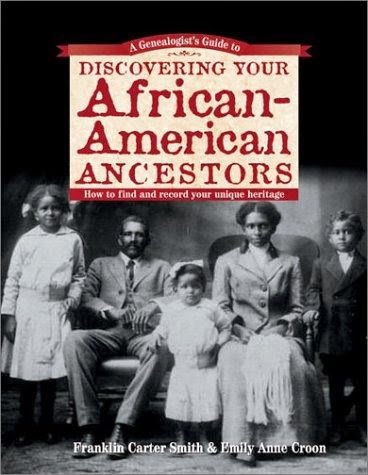 Mr. Smith is co-author of A Genealogist's Guide to Discovering Your African-AmericanAncestors. This book provides easy, step-by-step instruction for researching slave and free black ancestors pre- and post-Civil War. Mr. Smith excerpted examples from his book for the three seminars. Consult the Elders-oral tradition plays an important role. Identify family collectors and gatherers of information including obituaries, funeral programs, pictures, Bibles and documents. Pay close attention to your African-American ancestors’ neighborhoods in each census but especially 1880 and 1870. They likely lived with or near relatives, in-laws and pre-Civil War neighbors. Given names of former slaves are oftentimes more important than surnames. Note ancestors, family members and neighbors’ places of birth, both White and Black to see migration patterns. The second seminar was “Researching Pre-Civil War African-American Ancestors.” Mr. Smith offered more tips and strategies for this very different phase of research. The search prior to 1865 becomes a search for records that identify chattel property. Slaves were taxable chattel property. Locating the Slave as chattel property depends on identifying the chattel property owner-the Slaveholder. If your ancestor was free prior to 1865, look for Free Black registers- Free blacks were required to register annually at the county courthouse. The Rule of 1870- Most Freedmen and Slaveholders remained at or near where they were before 1865. The 1870 neighborhood can be the key to unlocking your ancestors’ history during slavery. Scour the 1870 neighborhood for potential slaveholder candidates. They might be next door. Research the white families in the 1870 neighborhood who had real estate including wives and in-laws. Use pre-Civil War censuses and tax records to create a timeline of when and how many slaves the family held. Deed books may name slaves as the subject of a sale, gift, devise, trust or as collateral for a mortgage. Check the deed and property transactions of the Slaveholder, their immediate family, and extended family including in-laws. Other documents in the deed books may include manumission papers, surety bonds for free persons of color and bills of sale. Probate and estate documents may list the names and ages of slaves. Look for records of slaveholders, spouses, parents, siblings or in-laws that died before 1865. Slaves are unlikely to be named in Estate records created after 1865. Wills may be especially valuable as they might list slaves by given names or full names with descriptions of color, size or age. Wills may also suggest slave family units or explicitly describe families. Wills might also not name slaves. Always search for an inventory and appraisal which is more likely to include names. Franklin Carter Smith citing the example of his family story of Native American ancestry. His research indicates that features attributed to Native American ancestry are most likely due to a European ancestor, William Dotson, 1794-1858. I own an autographed copy of A Genealogist's Guide toDiscovering Your African-American Ancestors and I highly recommend it as a reference guide.